Where did all these Easter Egg ideas come from? I have always thought it was odd that the symbols of secular Easter celebrations were primarily rabbits and eggs. After all, while both are signs of spring and new life, rabbits do not lay eggs. I may never understand why the Easter Bunny carries a basket of eggs, but he does, and I’m not arguing with anyone who brings me my favorite kind: chocolate-covered! A quick Google search can fill you in on the many legends of the Easter Egg and the Easter Bunny, but if you’re like me, you’re looking for some Easter Egg Ideas that can help you tell the story of Christ’s resurrection to your kids, while creating some fun crafts and precious memories in the process. We have always loved using the Resurrection Eggs as part of our Easter traditions. Originally created by FamilyLife, these are a dozen plastic eggs which each contain a symbol of the real Easter Story (a nail, a piece of purple cloth, and so on). The last egg, however, is empty, signifying the empty tomb and the resurrection of Christ. 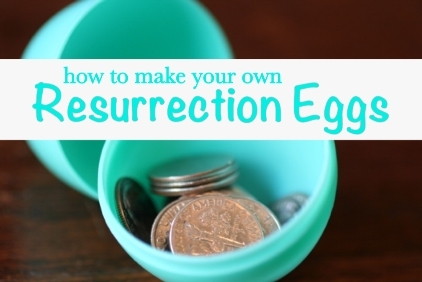 You can create your own Resurrection Eggs by simply purchasing some plastic eggs and filling them with objects and Scriptures that will help you tell the story of Easter to your children. Use the ideas below or come up with your own to tell your kids about our salvation in Jesus Christ. Branch – Matthew 21:1-11. Use a leaf with its stem. Roll it up loosely to get it into the egg. Bread – Matthew 26:26. Use a piece of bread if you are going to open the egg right away. You may also use a piece of cracker. Silver coins – Matthew 26: 14-15. Use 30 coins: dimes, nickels, or quarters. Pack them into the egg. Purple cloth – Mark 15:17. Grab a piece of purple cloth from an old sheet, towel, or outgrown clothing item. Thorns – Matthew 27:29. Use a cutting from a thorny bush or even a rose stem. Rope – Mark 15:15. Use a piece of rope that is pretty thick. Cross – John 19: 17-18a. Try using a cross from a piece of jewelry. Often Christian book stores have little plastic or wooden crosses that would fit in the egg as well. Nails – John 20:25. Use a couple of nails from your toolbox. Sign – Luke 23:38. Cut a strip of paper to 1 inch by 3-4 inches. Write these words on it: THIS IS THE KING OF THE JEWS. Roll it up like a scroll. Sponge – Matthew 27:48. Tear off a piece from a kitchen sponge. Rock – Matthew 27:59-60. A rock small enough to fit inside the egg will do. Nothing – Matthew 28:6. Be sure this egg remains empty. Older children will be able to open an egg each night, read the accompanying Scripture, and talk with you about what it means. Younger children might just need a sentence or two to plant the seeds for future discussions. If you don’t want to make your own, you can always order Resurrection Eggs from Amazon HERE. We’ve had our set for several years, and it is a treasured part of our Easter celebration. How do you share the real story of Easter with your children? What are your favorite resources to use? Take a look at more Easter Ideas on Faithful Provisions.